I bought a box of Hat's Roman auxiliaries back when they came out in 2003 (see photo, left). I've been meaning to paint them up for a WAB army. Zvezda came out with their auxiliaries in 2007 (see photo, right). I just got a box last week. 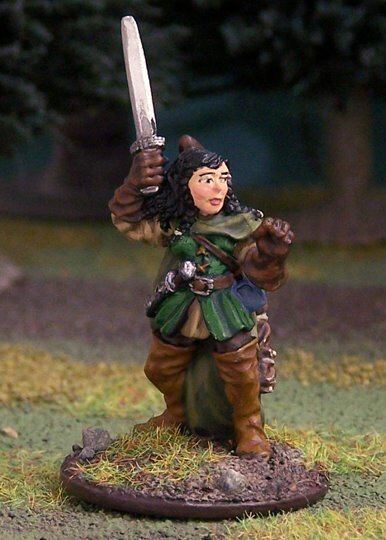 They're great sculpts, with especially nice command models. I know Zvezda is generally larger than Hat, but I thought the difference would still be acceptable. Nope! Maybe when looking down on a tabletop the difference won't be so noticeable, but up close they're pretty incompatible. Hat's auxiliaries are really small. They're actually kind of small when compared to other Hat models—especially the newer sets. They match up very well with Hat's Legionaries, and the Zvezda auxiliaries tower above my Celts and Romans, so I'm sticking with Hat for my WAB army. To make my shields I bought .75mm sheet styrene (plastic card). The nice thing about this stuff is that you can score once or twice with a blade, then snap off a piece. 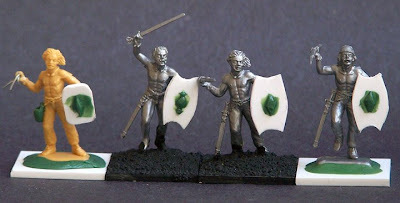 I selected the Italeri/Zvezda celts because the shields in this set are separate from the figures. I started out free-hand drawing the hide-shaped shield, but found that it was easier to trace the set's oval shield instead. I traced the line with an X-Acto blade and drilled a whole with the same blade. I filed the shield edges, and I sculpted the shield bosses with Kneadatite (green stuff). 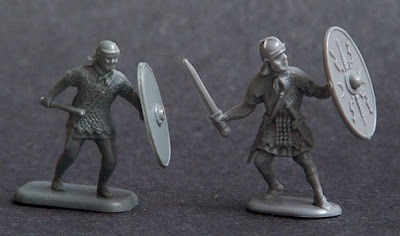 My slinger on the left is holding a shield based on the Hjortspsring find (see celtic shields article bellow). 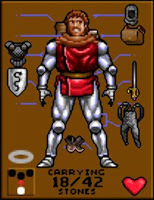 Among PC RPGs the Ultima series had the uncommon requirement of feeding your company. 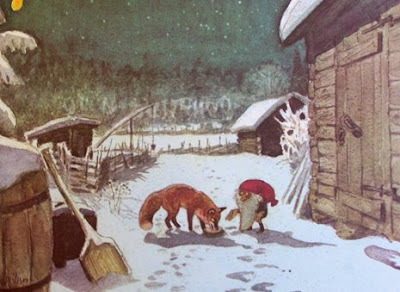 Food could be purchased in the villages' pubs, or it could be obtained through hunting. If your characters went without eating for too long they starved to death! 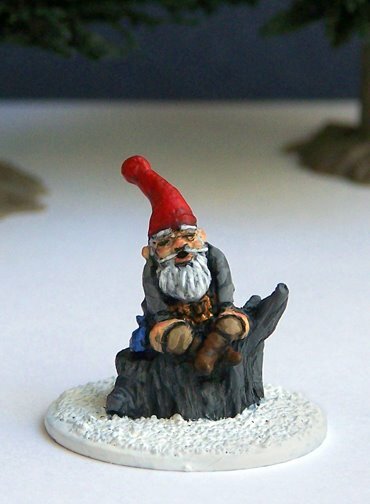 Consequently, these little thieving gremlins could be quite troublesome in the wilderness. Caesar Miniatures is a toy soldier company producing plastic models in 1/72 scale. They specialize in historic models, but in 2007 they came out with some very nice fantasy sets. I'm already heavy into 1/72 historics and 28mm fantasy, so I had been trying to resist getting into still another genre/scale. But! I finally have a reason to buy a box of their F105 Goblins. 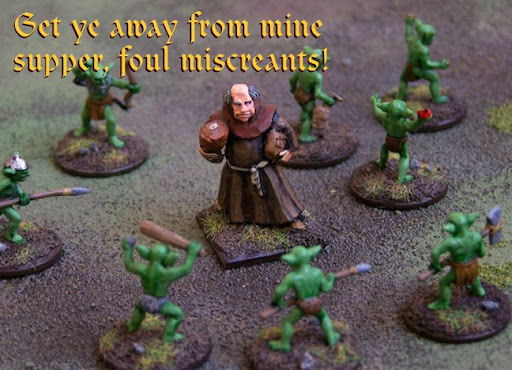 When these 1/72 goblins are compared to 28mm figure, they are the perfect size for the diminutive gremlins in Ultima's Britannia. I mounted these little goblins/gremlins on pennies. In the second photo I painted a hand grenade to look like apple. I removed a knife and sculpted a bag (of food), and I presume the third gremlin is throwing rocks, but I painted tham as potatoes. Song of Blades and Heroes has stats for gremlins. It might be interesting to figure out some special rule to represent the gremlins' theft of food. Dupré has always been one of my favorite characters in the Ultima PC games. He's a rogue with alot of gusto—kind of a Han Solo type. My Dupré model comes from Black Tree Designs' 100 Years War range. 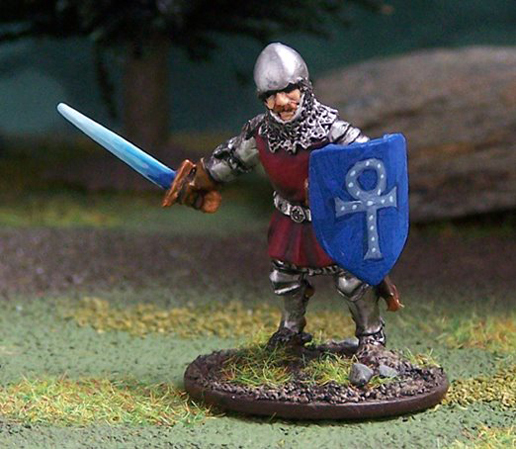 The shield provides a great way to brand the model as a character from Ultima. It's emblazoned with the ankh, a symbol important in the fictional world of Britannia. Rather than a plain steel sword, I attempted to paint a magical blue glow. The image at left is from Ultima VII. See Dupré's bio on Ultima Wikia. In the Ultima series if PC RPGs, Katrina is a companion of the Avatar. As with many of the characters, Katrina is based on a real-life friend of game-creator, Richard Gariott. The above model is from the German manufacturer, Metal Magic. That company is now out of business, but it's molds were purchased by Mega Miniatures. The models is available for $1.50! Unfortunately, there isn't anything particularly distinctive about Katrina's appearance. So, apart from the hair color, I have to admit that there's really not that much to this model that marks it as Katrina. While playing Ultima I never really had Katrina in my party. By the time I reached her island home, New Magincia, I had all the companion slots filled. See Katrina's bio on Ultima Wikia. These sheep come from Gripping Beast. The models were sculpted specifically to look like the Manx Loghtan. This is a very ancient and rare breed with the unusual trait of both males and females growing multiple horns. It is thought these descend from the livestock of the Norsemen when they met with the native Celtic sheep in the north of Britain. The breed survived into modern times in isolation on the Isle of Man. 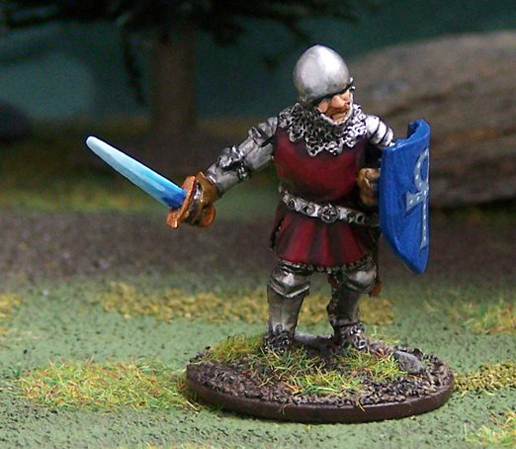 The horn-blowing shepherd is a model from Old Glory Miniatures' Revolting Peasants set. The wolves are old Grenadier sculpts. These are available from Mirliton.it. Wolves no longer roam Britain. They were killed off in the 1600s. 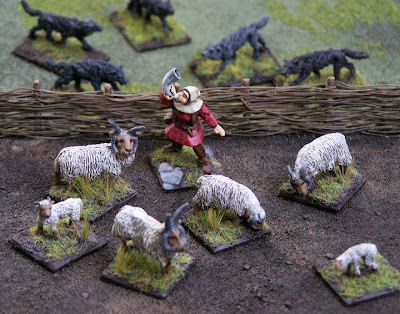 A fun use of livestock models in tabletop gaming is to set them as targets for raids (as in PigWars). Points could be awarded for each stolen sheep. The Song of Blades and Heroes's supplement, Song of Arthur and Merlin, includes rules for raiding livestock. 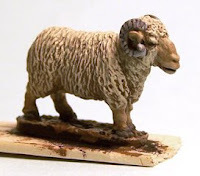 Setting grazing sheep models on the tabletop also adds to the pastoral ambience of the terrain! Wade-Martins, P., The Manx Loghtan Story. The Decline and Revival of a Primitive Breed. Geerings of Ashord Ltd. (publ. in association with the RBST. ), 1990.110 pp. Ancient British sheep article on the Butser Ancient Farm website.